The Grammy Award-winning singer had the "best day of his life" when he visited the real-life movie set - the home of the hobbits - from the 'Lord of the Rings' and 'The Hobbit' trilogies which is located on the North Island of the country. Sam is enjoying some well-deserved time off from his 'In The Lonely Hour Tour' before he performs in Auckland on April 22 and fulfilled a life-long ambition to visit the set where Peter Jackson made his movies on Tuesday (21.04.15). 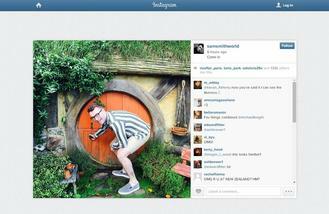 Sam made a series of posts about his visit on his Twitter handle and linked to several images of his tour on his Instagram account, one of which showed him entering a hobbit house. The 'Like I Can' hitmaker even got to enjoy a "hobbit ale" at the Green Dragon pub. His posts read: "Best day of my life ... I feel like Frodo ... Geeking OUT ... I would chop off my toe to live here and be a hobbit x ... I'm sipping on some hobbit ale at the green dragon x (sic)"
Sam loved his visit so much he plans to return to Hobbiton in the future and when he gets home to the UK he wants to build his own hobbit house. He tweeted: "What a day. I am coming again. Until then I'm actually gonna build my own hobbit house. No joke x (sic)"
In an earlier Instagram post about his time in New Zealand, Sam admitted the opportunity to travel was one of the reasons why he wanted to become a musician. He revealed: "Travelling is to me one of the most important things in life. It's of the main reasons why I chose this career path. What's the point in living on this earth and not seeing it!!!! I am so aware though that many people don't get opportunities to see places like this and would love to!! Deep chats, real chats. (sic)"